It's brother versus brother and the outcome could decide the fate of billions. Uncanny X-Men's "Rise and Fall of the Shi'Ar Empire" continues here! Vulcan is the Shi'Ar Emperor and Havok is leading the rebellious Starjammers. But who is really right and who is really wrong? 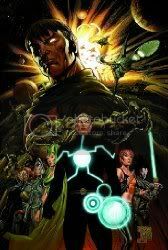 Collects X-Men: Emperor Vulcan #1-5. I'm going to make a confession here early on in the year... I like X-Men comics. I've been reading them for years (since the mid-80s sometime). It's a real guilty pleasure for me. My interest waxes and wanes periodically, but I always end up coming back to them. I've recently been picking up the collected editions of the comics after a long wave of not reading them, so you'll just have to bear with me as I feed my inner geek on occasion. I'm not going to review these really at all, because to be honest, if you haven't been reading right along over the last 20-40 years, you're going to be lost. Hell, I've been reading for 20-30 years and I get lost every once in awhile! So, there it is. My early year confession to a geeky guilty pleasure! Emperor Vulcan picks up right where The Rise and Fall of the Shi'Ar Empire left off, with the X-Men who were stranded in space having to form an uneasy alliance with Vulcan to repel the advancing attack of the Scy'Ar Tal, a race bent on the destruction of the Shi'Ar Empire. Not a very satisfying ending, as it's not really clear what happens (are the Scy'Ar Tal destroyed, where did Marvel Girl go? ), but I guess it's leaving enough questions open for the follow-up series, Kingbreaker, and the larger War of Kings series.